As I promised on my last post, this year I want to make sure that I keep updating my blog so you know a little more of what I've been doing. 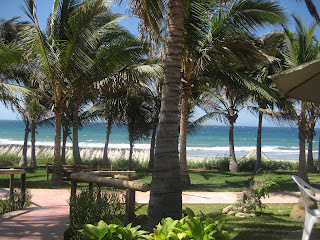 And sticking to my promise I need to tell you about my 3 and a half holidays back in Peru. I arrived back to Amsterdam last Monday afternoon after a very short, direct and uneventful KLM flight...so it felt weird that after such a short flight I was suddenly away from Lima and back into my daily reality. However the next morning, cycling to the bus stop to get to work: the cold, the bike, the darkness and the rain brought me totally back to reality. The several layers of clothes and the boots after having been wearing very light stuff and sandals....were an even bigger reminder. Usually, I get a little depressed on my first week when I get back to the Netherlands after having been "home". However I think that this time it really helped that Italo arrived only the next day (for the ones that don't know Italo is one of my best friends from university who moved to Europe a year ago and he is currently my flatmate). Having someone who was feeling the same as me, someone who had been in the same places that I had been, someone with whom to talk and remember...did me the world of good! That, and also the THOUSANDS (I'm not kidding) of photos from those 3 and a half weeks. Antonella (my youngest sister who was also there) and me are both photo freaks...so each one of us with our cameras took so many photos. And of course...so many of our friends did the same and we managed to compile several of them. So since I've arrived I've been looking over and over again to all the fun and the amazing things we did during our holidays. And actually that's what's taken me so long to write this post: sorting out the photos and choosing just SOME is not an easy job. Let me summarise my holidays for you (I'll write down with more details the different activities in later posts). I one sentence: It was AMAZING! This has been the longest time that I haven't been back in Peru (1 year and 2 months) so towards the end I was counting the days and the hours! And it has been a mixture of family time, time with friends, visiting my own country and also being a host. Why's that? Because besides me, Antonella and her husband (Gus) getting there we had some friends joining us! All the way from Amsterdam, Eline and Joost joined us on the 24th and 27th respectively. And Martin a German friend of mine who used to live in Amsterdam and who now lives in Vienna also joined. As you can imagine having friends over is an amazing experience. You can show them a little about your own countries, your own traditions...it was just so great to have them. Besides them we also had 2 more guests: Murphy and Jason from Aspen. If you have read my early posts on this blog (about March and April last year) you must remember the names. 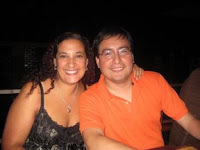 Both of them had come to Peru for Anto and Gus' wedding and then they were really great hosts during my holidays in Aspen. So they decided to come again and join us for the fun! And when I say FUN...I'm really not kidding! It appears that we had the right combination of people...but between all the activities I think this has been the month when I have slept the least in my life (without counting exam time at university!) and also the month when I have seen dawn more often (also without counting me seeing dawn from my desk at work during the winter!). The first days were dedicated to the family. I arrived on Thursday 20th of Dec and Antonella and Gus on the 21st. 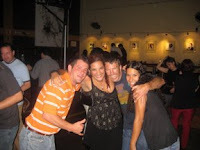 After a wild party in "Gotica" in Larco Mar on Saturday we spent most of our time until Christmas with the family. We had a really amazing Sunday BBQ, a great Christmas eve and Christmas day. We have eaten a lot, enjoyed each other and true to our tradition we have sang SOOOO many Christmas (and not so Christmasy) songs. 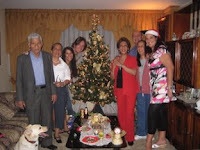 This has been the first Christmas after 9 years that gathers all of us...so we totally enjoyed it. Right after Christmas (already on the 25th in the evening) a group of us went to the airport to pick up Murphy...and we made our way straight to the Marriott casino...where Gus, Anto and me remembered our Roulette addiction in Vegas back in March last year ;-). It was a very good evening for the women (we all won something)...not so much for the men who lost. But all this to tell you that from then onwards the serious fun began. On the 28 at 4 in the morning a large group of us made our way to Piura and from there we drove 3 hours to our beautiful location for new year's: Mancora. Antonella and me had been organising this trip for about 9 months and I have to say that we have been SO happy with the results. 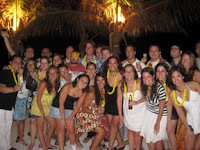 We combined a total of 30 of our friends: Peruvians living in Peru, Peruvians living abroad, Americans and Europeans. 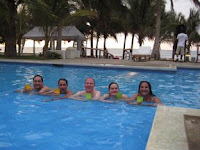 We had 15 of the 19 bungalows of Las Arenas de Mancora so you can imagine how much fun we had. 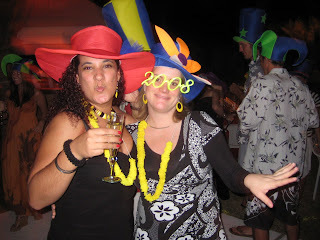 On the 31st we had an unbelievable fun New Year's party. I think one of the bests I've ever had. The setting was so beautiful, the people were just in the party mood, the food was delicious, music was great, warm weather, people dressed up and ready to party...it was just wonderful! I'm going to leave this post here and I will make use of the saying: "one image says more than thousands words" and I will have you look at the slide show below. I have managed to condense those thousands of photos in only 158...that summarise a little all my holidays in Peru (as they are done in Picasa you can double click on it and it will take you to a bigger page). Where's the next New Year Party??? Bonfisisters rock!! !